-An adorable beach bag ~ This one pictured is the Trina Turk Canvas Tote that was included in last Summer's FabFitFun subscription. 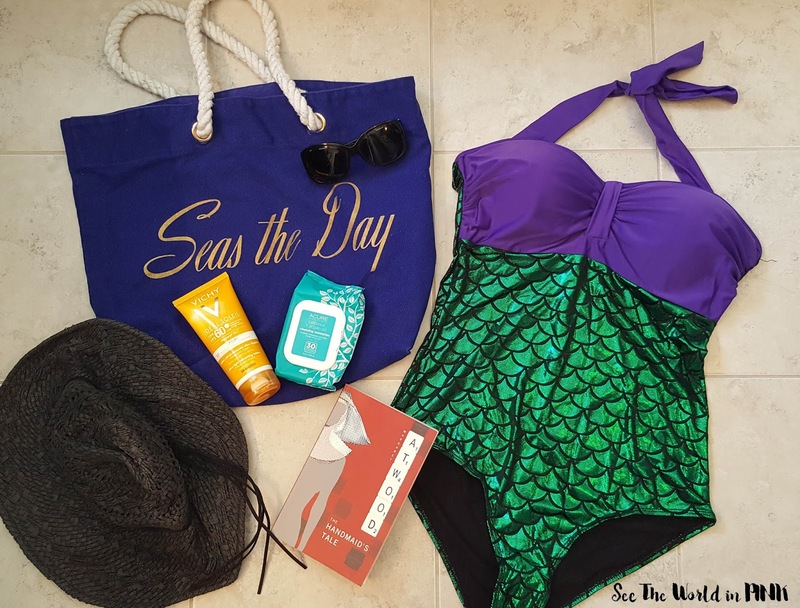 I love the "Seas The Day" saying and this tote is huge! -Sunnies ~ Make sure your sunglasses have UV protection - some of the cheaper pairs that are given out for free do not come with protection! These sunglasses are Versace and have lasted years! I always say to have at least 1 pair of quality sunnies especially if you are planning on being outside for long periods of time! -Suncreen ~ This is the #1 must - the higher the SPF, the better especially if you are going to being running around, sweating or in and out of the water! This Vichy Ideal Soleil Sport Ultra-Light Refreshing Lotion SPF 60 ($29.95 CAN) is designed for face and body use. It has wet skin technology, meaning it can be applied to wet or dry skin and offers 80 minutes of sweat and water resistance. This will be my Summer go-to! -Cleansing Wipes ~ The only other skincare that matters by the water! I use cleansing wipes after the pool to get the chlorine or salt water off my face or at the beach for sand and sweat removal! These Acure Coconut and Argan Oil Cleansing Towelettes ($9.99 CAN) are great for removing makeup, sweat, dirt, environmental toxins, etc. and are soothing and refreshing on the skin! Plus, these ones are all-natural! -Sun Hat ~ A big, floppy sun hat works with your sunnies and sunscreen for added sun protection on your face and upper body! They are also adorable so that helps too! This one is from Asos and I have had it for a couple years now! -Beach Read ~ I love an intense read for the beach (although, once in a while it's nice to mix it up with something, light and romantic) - I get some of my best reading done relaxing by the water! I'm currently working on The Handmaid's Tale by Margaret Atwood and if you haven't read this yet, I suggest you grab it for one of your beach reads this Summer! Not pictured, but equally essential, I also pack a water bottle (hydration is a must! ), lip balm (preferably one with SPF protection), aloe vera gel (instantly sooth skin after sun exposure! ), and a big, fluffy towel! What are your beach and pool day essentials?